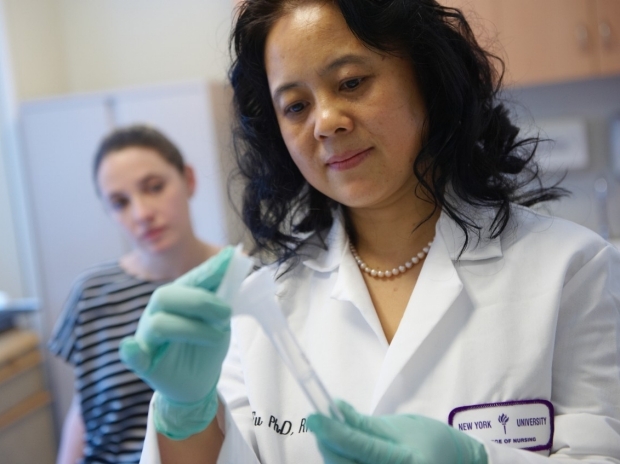 “Using a well-trained classification algorithm to detect lymphedema based on real-time symptom reports is a highly promising tool that may improve lymphedema outcomes,” said Mei R Fu, PhD, RN, FAAN, associate professor of nursing at NYU Meyers and the study’s lead author. “Clinicians often detect or diagnose lymphedema based on their observation of swelling. However, by the time swelling can be observed or measured, lymphedema has typically occurred for some time, which may lead to poor clinical outcomes,” said Fu. “In our digital era, integrating technology into health care has led to advances in detecting and predicting various medical conditions,” said Yao Wang, PhD, professor of electrical and computer engineering at NYU Tandon School of Engineering and the study’s coauthor. A type of artificial intelligence, machine learning is of interest to researchers due to its ability to construct algorithms that continually improve predictions and generate automated knowledge through data-driven predictions or decisions with incoming data–in this case, symptom reports. Machine learning is particularly beneficial when there are many relevant factors that are not independent, which is true for lymphedema symptoms. “Such detection accuracy is significantly higher than that achievable by current and often used clinical methods,” said Fu. The researchers note that conducting such real-time lymphedema assessment encourages patients to monitor their lymphedema status without having to visit a healthcare professional. Based on patients’ symptoms and resulting risk for lymphedema, the assessment system could alert patients at risk to schedule in-person clinical visits for further evaluation. This may lessen the burden of unnecessary clinical visits on patients and the healthcare system. “This has the potential to reduce healthcare costs and optimize the use of healthcare resources through early lymphedema detection and intervention, which could reduce the risk of lymphedema progressing to more severe stages,” Fu said. In addition to Fu and Wang, authors include Chenge Li of NYU Tandon; Zeyuan Qiu of New Jersey Institute of Technology; Deborah Axelrod and Amber A. Guth of NYU School of Medicine and NYU Perlmutter Cancer Center; Joan Scagliola of NYU Perlmutter Cancer Center; Yvette Conley of the University of Pittsburgh School of Nursing; Bradley E. Aouizerat of the Bluestone Center for Clinical Research at NYU College of Dentistry; Jeanna M. Qiu of Harvard University; Gary Yu, Janet H. Van Cleave, and Judith Haber of NYU Meyers; and Ying Kuen Cheung of Columbia University’s Mailman School of Public Health.